“I wish babies came with a care manual,” say most first-time mothers during their little ones’ first days of life. Although such a manual for newborns doesn’t really exist, we’d like to offer you a small guide to help you stay afloat during the first few months of motherhood. Basic care instructions for newborns are difficult to list, especially because not all babies have the same needs. Some are born with a condition that requires special attention, which makes it impossible to create a manual that details absolutely every topic. But this is no excuse for us to not want to help those first-time mothers who feel overwhelmed with their first-born. Here are three recommendations that will simplify the complicated and wonderful job of being a mother. The first thing mothers should know is that there is no reason to feel bad if you feel like you’re not producing enough breast milk in the days after childbirth. Babies slowly activate the hormones oxytocin and prolactin, which are repsonsible for producing this precious liquid. As more time passes with your baby latched on, it will become easier to produce milk. A crucial fact is that during the first few days, the mammary glands make a substance called colostrum – first milk – that has an important immunological effect on the baby’s development. Don’t be alarmed if you think your baby is not eating sufficiently or is dehydrated. During the first hours of life, a few drops of colostrum is sufficient for satisfying your baby’s small stomach. Every newborn begins the world again. Milk production will increase as your baby suckles more. The key to knowing whether your baby is extracting milk is to keep track of the number of times you change their diaper. If it is wet, they’re clearly not dehydrated. According to specialists, a newborn can sleep up to 18 hours a day, but mothers are worried that this sleep schedule is not continuous. Babies sometimes wake up every two or three hours to feed. We can recall that while still in the womb, babies dedicate a great deal of time to sleeping because there is no difference between day and night in the womb. Then how can we adjust to this sleep new sleep schedule? Venezuelan pediatrician Miguel Raga recommends that mothers create a schedule for feeding their babies for the first 15 days after birth. The strategy consists of waking up with the baby at 6am to feed. From this first time, the baby should be fed every three hours. The strategy is as follows: 6am, 9am, 12pm, 3pm, 6pm, 9pm. After the last time, at around 9:00 p.m., the baby can sleep longer and their sleep is deeper. Of course, we can’t forget that we should breastfeed whenever necessary, so if the baby wakes up in the middle of the night, we should respond to their cry for milk. 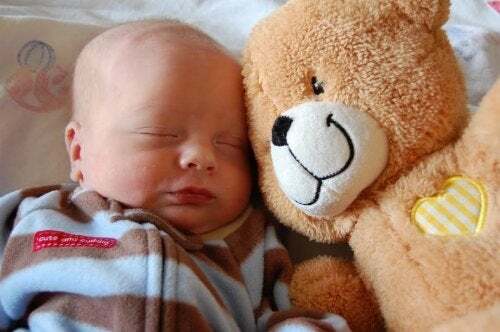 A newborn can sleep up to 18 hours a day. The key to this feeding plan is to be disciplined in order to see results, since various mothers were sure that with this method, their babies were able to sleep throughout the night by the second month. The baby’s first bowel movement will be very dark, between a green or almost black color. This is called meconium and looks like it should be composed of mucus and secretions that accumulated in the infant’s intestine while it was in the womb. So when you see your child’s first stool and notice the diaper is covered with a dark substance, there is no reason to worry. Their digestive system will also adjust with each passing hour. Some babies have two stools a day, while others can have zero in 48 hours. To be sure everything is going well, try to keep a notebook with the time your baby defecated, and give your pediatrician all the details when you take your child to their first medical check-ups. We know there is much more to the basic care of a newborn. But we wanted to focus on their most basic needs, since these will be of most concern to mothers who strive to do an excellent job. Do not let the responsibilities of motherhood overwhelm you. Trust yourself and your abilities. We assure you that there is no better way to take care of your baby.